In March the Australian Dollar fell from USD 0.7106 to USD 0.7096. The MSCI World Index rose 1.32% and the S&P 500 1.94%. The ASX 200 rose 0.97%. All these are total returns including dividends. We gained 0.53% in Australian Dollar terms and 0.40% in US Dollar terms. Our currency neutral rate of return was 0.39%. The target portfolio gained 1.10% in Australian Dollar terms and the HFRI hedge fund index 0.97% in US Dollar terms. So, we underperformed our benchmarks. The table also shows the shares of these investments in net worth. At the bottom of the table I also included the Australian Dollars return from foreign currency movements and other net investment gains and losses - net interest and fees. This time I also combined all individual corporate bonds into a single investment. Their individual returns are not very informative. 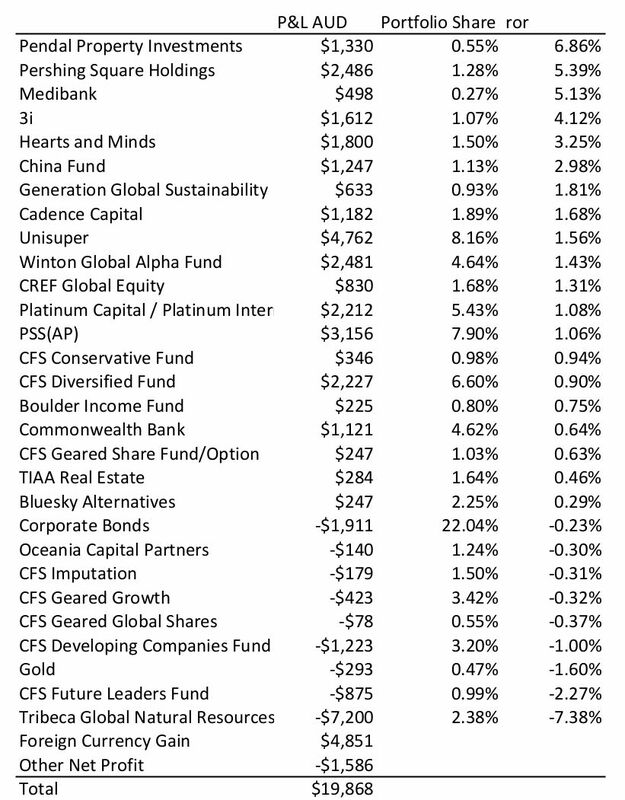 At the asset class level only Australian small cap stocks and hedge funds lost money this month. U.S. stocks were the best performing asset classs. Pendal Property Investments an Australian fund of REITs did surprisingly well. Pershing Square Holdings continued to gain as Bill Ackman turned round his recent poor performance. 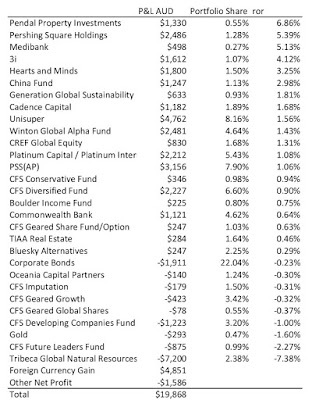 The Tribeca Global Natural Resources listed hedge fund performed very badly this month. The main driver is continued movement of cash from my US bank account to Interactive Brokers where I am buying bonds before eventually transferring some of the money to our Australian bank accounts when the broker allows..... We are now quite underweight in Australian shares. USD 135k of corporate bonds matured (Santander UK and Welltower) and I bought USD 284k of bonds (HCA, Virgin Australia, Viacom, WGL, Goldman Sachs, and Kinder Morgan). I bought 755 Commonwealth Bank hybrid securities (preferred stock). I sold 10,000 shares of PIXX.AX and bought 30,000 shares of PMC.AX after the premium to NAV of the latter fell substantially. I bought another 1089 OCP.AX shares. I applied for the Pengana Private Equity IPO. * Total leverage includes borrowing inside leveraged (geared) mutual (managed) funds. 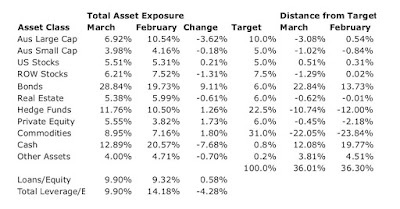 The allocation is according to total assets including the true exposure in leveraged funds. 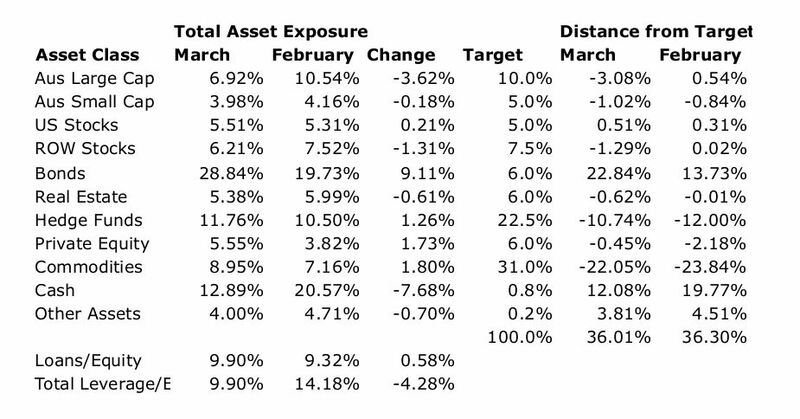 From this month though we no longer have any leveraged funds.